For some time now, images in science have been an object of study in the history of science. The multiple roles that images play in scientific practice have been recognised and discussed. However, little attention has been given to science related images in educational contexts. The case of geology is all the more relevant because it is considered that it has a specific visual language that is intrinsic to its own constitution as a science. 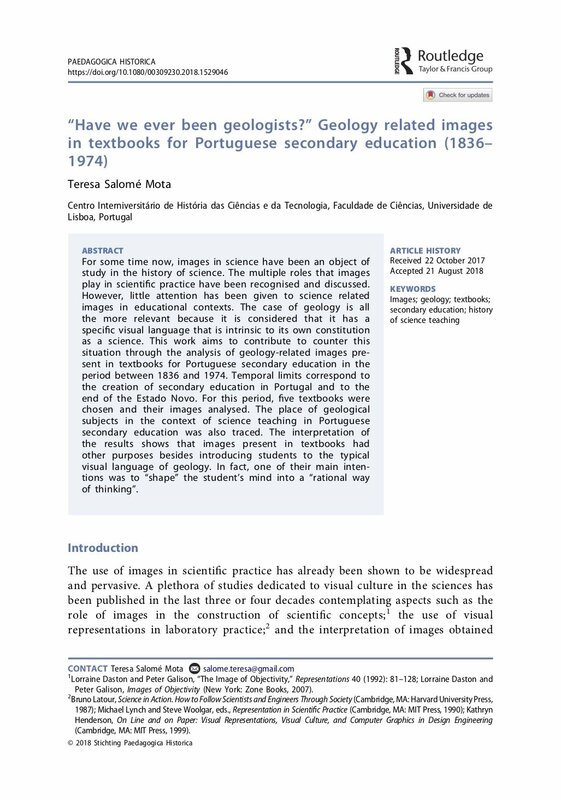 This work aims to contribute to counter this situation through the analysis of geology-related images present in textbooks for Portuguese secondary education in the period between 1836 and 1974. Temporal limits correspond to the creation of secondary education in Portugal and to the end of the Estado Novo. For this period, five textbooks were chosen and their images analysed. The place of geological subjects in the context of science teaching in Portuguese secondary education was also traced. The interpretation of the results shows that images present in textbooks had other purposes besides introducing students to the typical visual language of geology. In fact, one of their main intentions was to “shape” the student’s mind into a “rational way of thinking”.